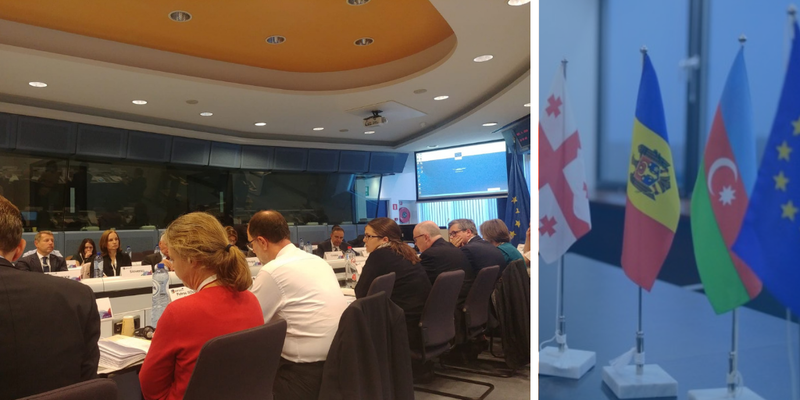 On 4 October, Eastern Partnership Civil Society Forum (EaP CSF) delivered the opening remarks at the Eastern Partnership Senior Official Meeting in Brussels, giving a civil society perspective on 2020 Deliverables and recent developments in the region. Speaking on behalf of EaP CSF, Steering Committee member and Working Group 5 Coordinator, Goda Neverauskaite mentioned that “Eastern Partnership policy has led to good results” in a number of areas but there is still a lot to be done, particularly in strengthening institutions and addressing governance issues. Today’s challenges, such as state capture, corruption or disinformation, require further engagement with civil society and more ambitious approaches – in fostering a real relationship between EU institutions and partners in the region. This is the expectation in Armenia, for example, where the current government is taking serious steps in reforming the institutions, inherited from the old regime. We also need more long-term strategies for “backsliding countries“, like Moldova. While welcomed as a “prompt” reaction, “financial consequences are not a big enough carrot or a stick to improve the situation” in Chisinau, sumed up Neverauskaite. Civil society would like to see a more active presence of EU member states, which could give the necessary political impetus to the Eastern Partnership project – especially, in the interest of security and stability in the neighbourhood. We must move away from “neutrality as a preferred option for the EaP region”, warned Neverauskaite, which is being floated by some EU member states. This even more worrying amidst the discussion on proposed NDICI – Neighbourhood, Development, and International Cooperation Instrument. In its current form, it offers no separate neighbourhood funding or bares any mention of existing civil society programmes. Finishing on a positive note, Neverauskaite once more mentioned how much has been done in relation to 2020 Deliverables. They “are a step forward, in terms of providing a set of concrete results“, bringing about lasting change and positive outcomes in numerous policy areas.